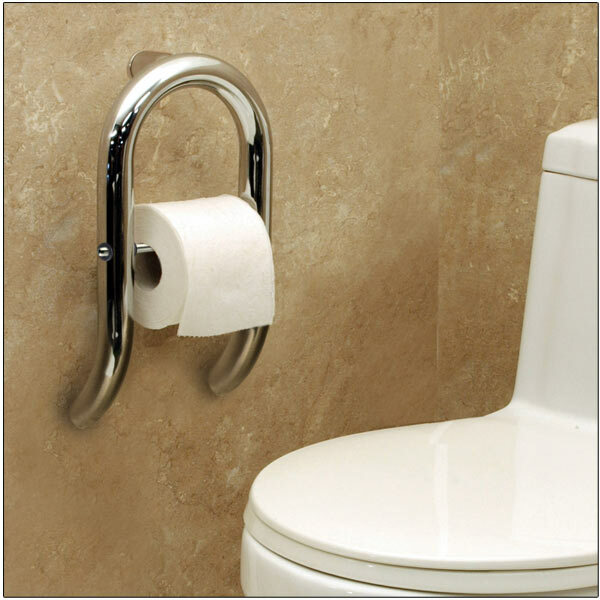 This Toilet Roll Holder with Integrated Support Rail combines soft lines and graceful curves with practicality and function. It is a stunning addition to any bathroom that offers discreet support for sitting down on and getting up from the toilet. Corian shelves provide ample space for toilet roll storage or other items while the discrete handrail offers reliable support. Supports up to 500 lbs. Discreet wall stems with concealed screws makes mounting areas virtually invisible. Multi-contact wall support; 4 points of contact for maximum structural support. Made from durable, rust, resistant stainless steel. Available in Polished Chrome.